Say your prayers and send zombies to Hell. Ghosts'n Zombies is creepy, and not in a good way. TipCat Mobile's bizarre App stars a bushy eye-browed monk, sent from the Vatican to do God's work, which basically amounts to shooting ghosts, bats and zombies with a plethora of different guns. 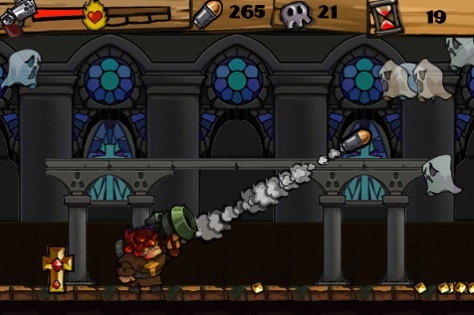 Meanwhile, clicking the weapon icon at the upper left corner of the screen causes an angelic figure (the Virgin Mary, perhaps) to appear and deliver a rocket launcher or mini-gun; just like she does in the Bible. Controversial subject matter notwithstanding, this is a polished and semi enjoyable shooter that quickly grows repetitive. To play, simply tilt the iPhone left or right to make the monk (Father Smith) walk. When monsters appear, you kill the buggers by tapping them, which instructs the monk to open fire in that particular direction. Each slaughtered creature drops crystals that serve the dual purpose of replenishing his ammo and health. When the counter reaches zero, the Grim Reaper appears and cuts off his head. Again, just like in the Bible. 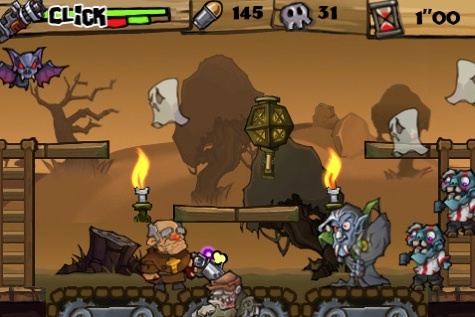 Ghosts'n Zombies offers brief moments of fun and sports impressively polished graphics. We like how the monk's cross sways back and forth as he walks, and the environments were nicely detailed and varied, from inside a church to an outdoor location. Meanwhile, the controls feel solid, and we never had a problem targeting (and killing) bad guys. The game just loses its appeal after ten minutes. We quickly realized that there wasn't much to it except a bunch of kill rooms, where you move to a new location, destroy all of the monsters and then proceed to the next area. On top of that, you can only use the powerful weapons for brief periods of time, and there's little incentive to upgrade anything since the game's fairly easy. Don't get us wrong. For .99, Ghosts'n Zombies is a decent pick up, but the holy roller hero and been there/seen that design means you'll stop playing and ultimately forget about it days after making the purchase, but as that mustachioed dude said in RoboCop, "I'd buy that for the dollar." What's Hot: Only costs .99, in-game achievements, attractive graphics, semi addictive shooting. What's Not: Over the top religious, action quickly grows repetitive, little reason to upgrade weapons.